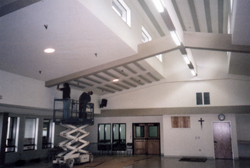 This 62,000 cubic foot cafeteria's ceiling and side walls are conditioned with 1300 linear feet of ASC's SoundPlank for a total coverage of 915 square feet. The existing RT60 is brought down from 3.75 seconds (measured) to 1.24 seconds (measured) -well within the RT60 range recommended for its room type. Scroll down for an audio before-after clip. The layout of the SoundPlanks provides well balanced room acoustics, with intelligibility greatly improved and yet a lively sound quality preserved. As noise builds up, people have to speak louder and louder to be heard. 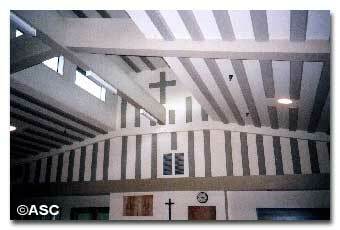 The "acoustic speed bump" effect of the arrayed SoundPlanks will slow down this noise buildup problem.